Personally, I found that both approaches take about the same amount of time, so pick any one of them - it won't siphon more your precious time. To use the former approach, start from step 1, if you'd like the latter you may skip to step 4 immediately. Pick Maven from type list. Click Next. Now you'll have to come up with GroupId and ArtifactId for your project. Refer to this page from Maven guide to learn about this. Generally, GroupId is your (or your company's) web domain in reverse. If you don't have one, just use your name or nickname, i.e. com.johndoe . ArtifactId is the name of your project. Pick your project's name and location. I usually name my projects just like ArtifactId to avoid confusion. That's it! You have your project now. Why's it have Maven type? Because it, first of all, it allows you to easily pull any kind of dependency into your project by just typing its GroupId and ArtifactId, and secondly it creates your project with well-defined folder structure that is considered de-facto standard for Java apps. You can learn more about it here. Navigate to https://projects.spring.io/spring-boot/ and copy the required dependencies from the Quick Start section. Paste those to your pom.xml and enable dependency auto-import to avoid the fuss of continuously reimporting dependencies each time you add, remove or change one. Now that we have our libraries, we're going to need to create a minimally viable code to make those libraries work. First of all, you want to follow the best practices and create a root package in src/main/java directory named after your project name. That's it! You now have your minimal Spring boot application. Skip to step 6 now. Spring Initializr usage in pretty straightforward - you navigate to the website, set up your project details and get a Zip archive upon clicking the big green "Generate" button. Instead of creating a project, click Import project now. The first two steps are important: you're supposed to point to your unzipped folder and pick Maven as your import's model. What comes next is essentially clicking Next until you get your new project imported to IntelliJ IDEA. Yeah, it's as simple as that. As per usual, the complete project can be found HERE. Just for the sake of completeness, I'll show how to add any kind of dependency into your Maven project. You don't have to do it to create your Spring Boot app, but it helps to know where to start in your development. Search <your library name here> maven. People mostly pick either the latest stable version (5.0.0 in this case) or the most used one. Copy the text to your pom.xml, specifically the <dependencies> section. Cannot start compiler: the SDK is not specified for module "myModuleName". 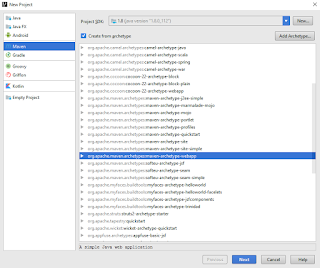 Specify the SDK in the Project Structure dialog. I was unsuccessful to select any Java directory for the SDK. What should I do? First, download JDK : www.oracle.com/technetwork/java/javase/downloads/jdk8-downloads-2133151.html (or locate one installed on your pc, if you have one.). Then go to module settings of your project (hotkey F4) and specify the location of JDK here. The thing is, if IDEA hadn't managed to autodetect JDK, you probably don't have it installed. Usually if you install JDK first, then open Intellij IDEA and create a project, you don't have to do this. Nice tutorial. It solved the problem I had when my Intellij IDEA Ultimate license ran out and I realized all the Spring stuff was gone from the community edition. Got me back to where I needed to be in a short time. Thanks! Glad to see my tutorial helps people! Sometimes it's the little things that count. Thanks a lot...It really saved my day! Great effort, much appreciated. One suggestion, can we have a bit larger images? It is hard for me to read. Thanks! Increased the image one size up (two in some cases). Did you know that you can left-click on any image and this will open up the Lightbox? The image will overlay on top of the page. Other images from the post will appear as thumbnails along the bottom. That's why I'm including so many images into my posts in fact - if you prefer reading you can read, if you're a visual person you can just click through a gallery of images.